Jeff Dozier’s research interests are in the fields of snow hydrology, Earth system science, remote sensing, and information systems. 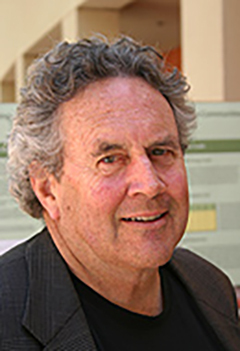 He led interdisciplinary studies in two areas: one addresses hydrologic science, environmental engineering, and social science in the water environment; the other is in the integration of environmental science and remote sensing with computer science and technology. His current projects investigate the retrieval of snow properties from remote sensing, especially in areas where data from surface measurements are sparse. Jeff Dozier will bring his snow hydrology expertise and collaborations with the California Council on Science and Technology to guide UC Water efforts. Jeff Dozier is a professor in the Bren School of Environmental Science & Management at the University of California, Santa Barbara, where he has taught since 1974 after receiving his PhD from the University of Michigan. He founded the Bren School in 1994 and served as its first dean for six years. From 1990-1992, he was the senior project scientist for NASA’s Earth Observing System when the configuration for the system was established. Among Jeff’s recent honors are the 2009 Jim Gray Award from Microsoft for his achievements in data-intensive science, his selection as the 2010 Nye Lecturer for the American Geophysical Union, and helping Disney Animation Studios win the 2014 Oscar for Best Animated Feature Film, Frozen. He is a Fellow of the American Geophysical Union and the American Association for the Advancement of Science, and an Honorary Professor of the Chinese Academy of Sciences. Dozier Dome in Tuolumne Meadows is named after him.